UPDATE: A Sunshine Coast family home has been reduced to charred remains after it was destroyed in a fierce fire. Fire crews could do little to stop the timber Queenslander from being totally destroyed by the fire which was reported shortly after 11am. Nambour Fire Station officer Jason Evans said a possible electrical fault in a fridge could have sparked the tragedy. "The owner was home but he was not inside at the time," Mr Evans said. 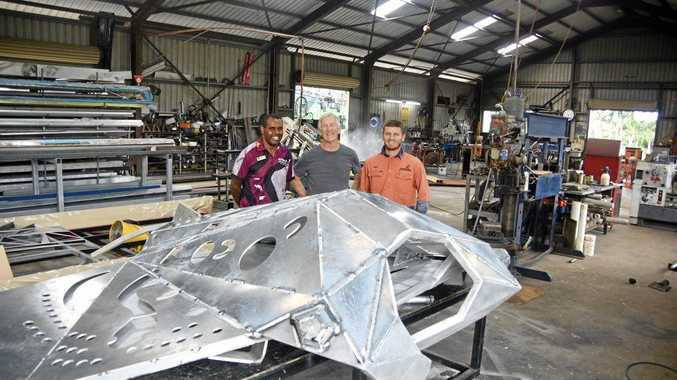 "An old Queenslander goes up extremely quickly so he really didn't have time to fight it." Mr Evans said crews could see smoke billowing from the Thompson Rd home as they pulled out of the Nambour Fire Station. It was reason for them to call in extra urban crews and four rural firefighting crews to try to ensure they had enough water to do their job. Flames were reaching up to five metres past the top of the roof when they arrived. "Due to the intensity of the fire I kept crews to the external of the building." A 100m cordon was set up by police after firefighters flagged concerns the home could have contained asbestos. It took crews about an hour-and-a-half to extinguish the fire. EARLIER: A fire which engulfed a home at Dulong, west of Nambour has been brought under control. Firefighters arrived just after 11am to find the two-storey Queenslander well-alight. The blaze was brought under control within half an hour. Sunshine Coast Council health officers are on scene due to fears the house could contain asbestos. 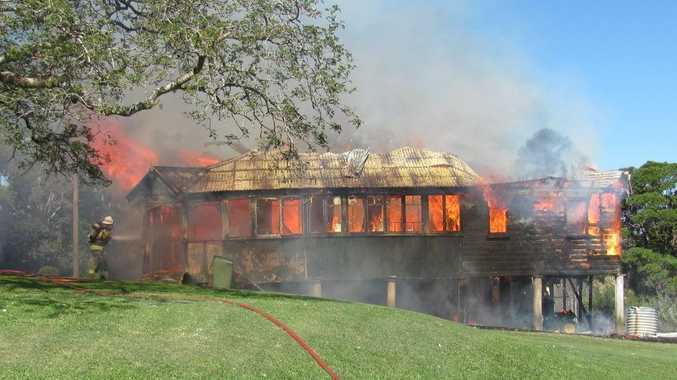 FIREFIGHTERS are battling a fierce house fire at Dulong, west of Nambour on the Sunshine Coast. The Queenslander was well involved by the time fire crews arrived. Initial reports indicate everyone is safe from the burning Thompson Rd home after the fire started about 11am. Queensland Fire and Emergency Service has rallied a number of crews to battle the blaze. Police have established a 100-metre exclusion zone on the street.